The new factory facilities can be calibrated to produce any number of a single item, however with increasing material and time costs per unit. To ensure optimal output for your factory lines you will have to recalibrate them every once in a while. Using a Decoder you're able to create factory calibration templates from any item you possess. This process destroys the original item, and the quality of the template will greatly depend on the quality of the Decoder used. You can use these calibration templates to calibrate a factory line to produce the original item as described in Mass Production. We're introducing the knowledge base, an expandable repository of the knowledge your character has of the planet Nia and the technology found there. The knowledge base can be expanded by researching robot kernels dropped by enemies. Using your knowledge base you can recreate any item about which you have enough information in a specialized workshop. This process requires huge amounts of resources compared to producing items with factory lines. Unlike Mass Production however Prototyping does not need an existing item or anything derived from it to create a copy. An item created in this fashion can of course be taken later to Mass Production by creating a Calibration Template from it. Roads: Our content team has been hard at work ensuring that all the islands are a lot more accessible from now on. We have also started adding more decoration to all the islands, with more to come soon. Teleport system changes: The teleport infrastructure has also been significantly upgraded between and on the islands. Everything is a lot easier to reach now. The look of the user interface also got a much needed revamp, we hope you like the new skin as much as we do! This patch also marks the introduction of SYNCos, the interface used by Perpetuum agents to communicate with Nia. Introduced the PVP flag: you will always get this flag when you attack another Agent, regardless of where you are. When you have the PVP flag, it means that others can attack you even in a police protected area, without police involvement. However, if they do so, they will also get the PVP flag. You will still get the aggression flag when you shoot someone without a PVP flag, and when you do this within the range of any police towers, you will still get destroyed instantly! The PVP flag can also be voluntarily turned on if you seek a good fight in a police protected area: check the new 3-dot green button on the status panel of your robot when on the terrain (which will turn red after you confirm it). Both flags are shown above robots just like before, the aggression flag in red, the PVP flag in yellow. Both last for 5 minutes. We also got a new loot tagging system: when you shoot a player or an NPC, it will be marked with an orange arc above it, which means you or someone has claimed it, and the loot it will drop will be tied to the one who marked it first. Others can try to open the container too, but good luck with the code :) This tag however has a 30 sec timer, so if you stop shooting it before it dies, the tag will disappear. Also, if you destroy the owner of a loot container, if will get freed up and available for anyone to open. Thanks to our lovely volunteers Ingo and Dmitry, both German and Russian languages are now available! Please report any typos or mistranslations you find at the forums. New: Safe logout feature: pressing the logout button when you're outside on the terrain starts a 1 minute countdown, and you will get disconnected when the timer runs out. This way you can be sure that you won't stay outside and get in dangerous situations when you do not have control anymore. 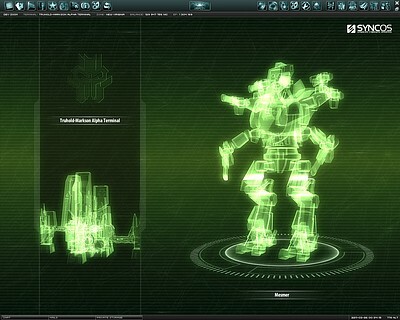 Safe logout cannot be engaged while in combat, and the timer will be aborted when you move your robot. Logging out while in a terminal still functions like earlier. Fix: Inaccurate position calculations that caused false "out of range" situations and probably affected line of sight calculations as well. Change: The radar displays now the range of all police towers, not just the one you're in. New: Warning message and sound when you leave police protected area. New: Warning message when you target another player or field container in a police protected area. Can be turned off and on again on the Options/Gameplay panel. Fix: Fixed a bug where a looted damaged item got repaired for free when you already had an unpacked item of the same type in your cargo. Change: Containers can't be targeted anymore. New: Requesting a new Arkhe happens now automatically. If you die and do not have one in your personal storage, you'll get one. Change: Completely removed all remaining features related to tracking. Change: New agents now start out on the terrain. Fix: Fixed a bug in the plant blocking slide-off routine that accidentally allowed you to climb a normally impassable slope. Fix: AFK mechanics should work now properly. You will be logged out after 30 minutes of inactivity on the terrain. Fix: Aggression between members of the Freelancer (NPC) corporation will be punished from now on. Fix: The combat log will now show the "Target has been destroyed" message only once per target. Fix: Other players sometimes didn't seem to turn towards their locked targets when you arrived in the zone after the lock happened. Fix: Moving a single item with shift (unstack) will not produce an error anymore. Fix: Changing charges in a scanner while scanning produced wrong results. Fix: Unstacking items in your cargo on the terrain now properly updates the cargo window. New: Dragging items into field containers can now be unstacked while holding the shift key. Change: The head bonuses of Thelodica mechs have been changed from tracking bonus to 1% critical hit chance per required extension level. Change: Unpacked volume of weapon tunings increased to 0.5U. Change: Tracking upgrades have been renamed to Range extenders and now provide optimal range bonus for all modules, while penalizing your accumulator recharge rate. They also require different extensions now. Change: Complexity of all faction specific mech enabler extensions increased from 8 to 9. Change: Selecting a Faction during character creation doesn't provide +5 on all attributes anymore, but instead in the next steps specializations have greater impact on your character's attributes, providing more points than before. Change: Material cost and price of light bots have been halved. Change: Drops of standard modules from NPC loot reduced, named item drops reduced much more. Change: Optimal range of Sensor suppressors decreased. New: Improved the slope capability display overlay on the terrain. It's also flashing up now briefly if you hit an impassable tile. New: Added new types of rock decorations. Fix: Fixed a few misaligned beam graphics. New: When a mission is completed and the Agent is in a private corporation, a portion of the mission reward is paid to the corporation according to the set corporation tax. New: Set a limit to how many times the same mission can be done: the same mission cannot be completed more than 3 times for the last 10 completed missions. Change: Removed all extensions tied into the old production system and introduced new ones for reverse engineering, mass production and prototyping. New: Activated mission specific extensions: Headhunter bonus, Industrial specialization, Logistics specialization and Tactics specialization. Change: Missile extensions have been merged together with turret extensions into a new 'Weapon usage' category. Fix: Secondary attribute of the 'Diplomacy' extension changed from mechatronics to politics. New: Introduced advanced and expert level terminal facilities: depending on faction and zone, terminal facilities have different base efficiency values. The level is shown in the facility tooltip: I-basic, II-advanced, III-expert. Higher level facilities provide more efficient production possibilities, but the system comes with an added logistics challenge. New: Production history is now available in Agent profile/Production. Change: Recycling damaged items now affects the material yield. Fix: Liquid type minerals were not behaving as liquids. Change: Alliances are now known as conglomerates. Change: Error and server messages on the terrain are now shown alyways on top. Fix: Objective points on the radar were gradually misaligned when zooming out. New: Music for the login screen and inside terminals. Fix: Fixed a bug that prevented you from doing anything on your own channel after setting a password. Change: Chat channel topics have been limited to 200 characters. New: Moving items between containers now automatically stacks them. Fix: No more 'Access denied' error when picking up and dropping an item in a robot's cargo. Change: Containers cannot be dragged into each other any more, they always have to stay in the private storage. Current nested containers have been moved to the root of the storage. Fix: Deleted and reused character names appeared as 'xy_deleted_xy'. New: Option for grayscale scanresult display on Options/Gameplay panel. New: Quit confirmation popup also when in windowed mode. Fix: Set a character limit to all input fields. Fix: Removing keyboard shortcuts didn't work. Fix: Fixed the help button link target on robot information windows. Fix: Made the gamma setting less sensitive.